This isn't the first Mini cooper BMW tuning shop AC Schnitzer's rolled athwart the tarmac, it's just the latest. Welcome the R56, a cosmetics and performance package created specifically for the latest, twin-scroll turbocharged Mini S, which produces 170 hp from the factory. 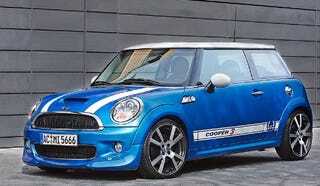 Under ACS's tutelage, the Mini will see a performance bump, though the company hasn't released its underhood kit yet. The suspension setup, ACS says, was tuned on the Nürburgring, and the bodykit — consisting of a front spoiler and rear skirt package with diffuser and new front bumper. Inside is an aluminum gear-shift knob and hand brake, and aluminum pedal trim. John Cooper would likely tip his cap.